We drove from Nova Scotia across the Confederation Bridge to Prince Edward Island, and the crossing was actually more fun than we thought it would be. At times you can see the sides of the bridge, and with the view of water on either side, we quite enjoyed the short ride over. After a little exploring as the rain clouds threatened, and then cold and rainy night of camping near Summerside, we searched for breakfast/coffee around Cavendish, our next major stop on the island. It really hit home at this point just how early we were for tourist ‘high season’; we could not find one single restaurant open in all of the Cavendish area (not even a Tim Hortons!)! We were determined to see Green Gables and Lucy Maude Montgomery’s homestead that day, and thankfully we ended up finding coffee and cinnamon buns at the tiny cafe on site. Hiking boots on and full rain gear equipped, we set out to stay as dry and warm as possible and explore the inspiration for the Anne of Green Gable books. The rain and cold weather were pretty tenacious while we were on the island, but it didn’t dampen our spirits since we had our night booked into the Airbnb and had theatre tickets, and we were happy to duck into the Water Prince Corner shop for dinner (bacon-wrapped scallops!!) and went to see Mamma Mia at the Charlottetown Festival! Now, I am not an ABBA fan, but not only had I heard high praise for the show but my friend Adam directed it, so I knew it would be a good time. It was SO much fun! Great cast, beautiful set, fantastic choreo, and I enjoyed an entire evening of ABBA music way more than I expected to! We had a wonderful time! Friday we spent the afternoon window shopping and enjoying some tea in a great little coffee shop called the Black Kettle, and then made our way to our next campsite. One night of reprieve from trying to sleep in a damp tent made us optimistic for another campground booking. We arrived at the KOA Cornwall campground and were amazed at the amenities including a kangaroo jumper (giant inflated canvas pillow for kids to jump on), bike-style ‘go carts’, kayaks, a pool (not open yet), and games room. Even last night there were card games galore and the staff were making popcorn for the guests. This was the busiest campground we have been to so far! Our campsite was kind of dreamy. We even made it to the original Cows Ice Cream Parlor (and self-guided factory tour), and tried a few popular flavours like Moo York Cheesecake and Wowie Cowie. Oh, the many bovine puns. Saturday we woke up to SUNSHINE! It felt like a miracle and we quickly changed our ferry booking from 1pm to 4:30 so we could stay on the beach at the campground a little longer. The beach! What we had been dreaming of as we planned this trip, was everything we had hoped it would be. I can’t get over how beautiful the red sand is here. 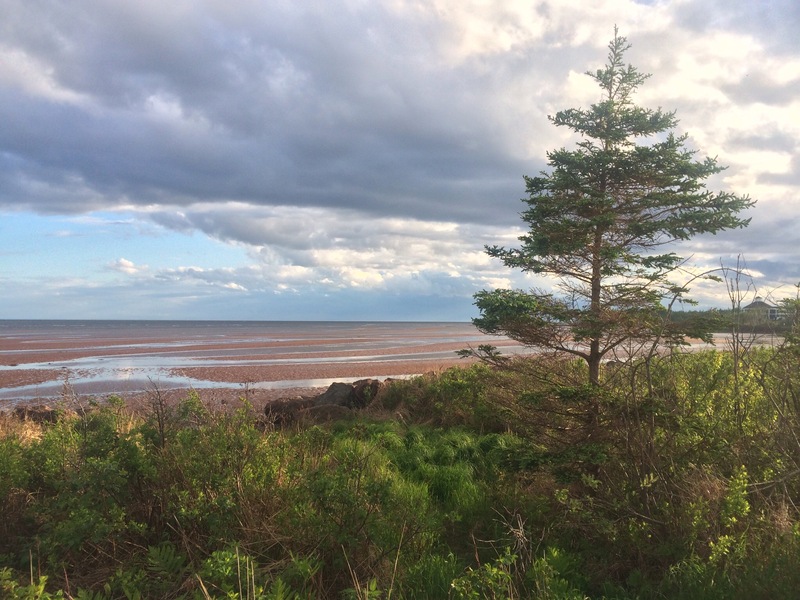 The farmers freshly planted fields are red, the shorelines and rocks are red, the dust is red, and this rusty earth is all due to the red sandstone that is found throughout PEI. 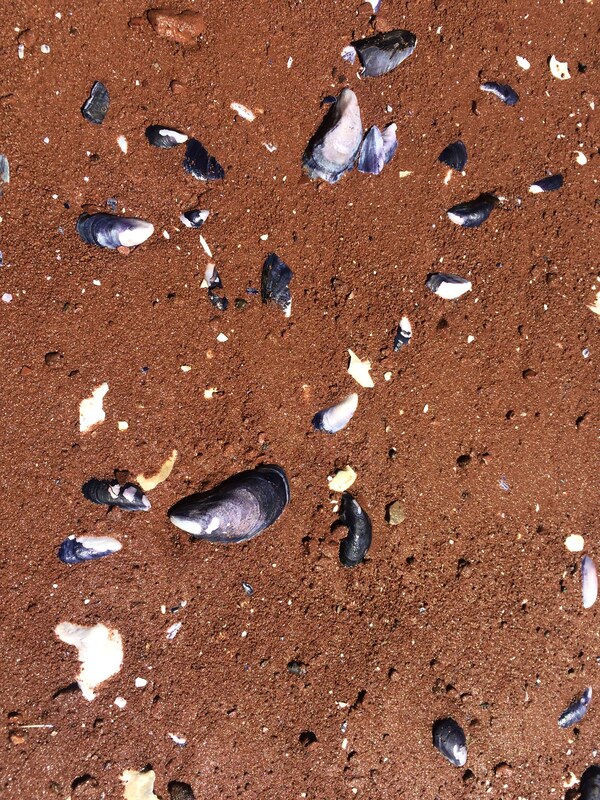 Our last day in PEI was perfectly delightful, and after a lazy morning in the sun on the shores edge, some sunbathing, reading, and a little barefoot walk (carefully) among thousands of shells and shell fragments in the shallow water, we packed up and headed to the southeast point of the island. We decided to take the Northumberland Ferry from Wood Islands Harbour to Caribou, Nova Scotia, which felt like a nice introduction to ferry travel, and a 75 minute ‘training session’ before next week’s 8-hour ferry to Newfoundland. We got to the park early and got to visit the Woods Island Lighthouse there, and see the inside of a lighthouse for the first time on our trip. Back to Nova Scotia we go, and on to Cape Breton and the glorious Cabot Trail!! ← To New Brunswick: the land of high tides!